No tae be ramfeeselt wi the unrelatit province o Hunan or the Swadish locality o Henån. 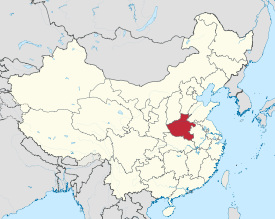 "sooth o the Yellae River"
Henan (Cheenese: 河南; pinyin: Hénán; Wade–Giles: Ho-nan), is a province o the Fowkrepublic o Cheenae, locatit in the central pairt o the kintra. Its ane-character abbreviation is "豫" (yù), namit efter Yuzhou (豫州 Yù Zhōu), a Han Dynasty state (zhou) that includit pairts o Henan. Although the name o the province (河南) means "sooth o the river", approximately a quairter o the province lees north o the Yellae River, kent as the "Huang He" an aw. Wikimedia Commons haes media relatit tae Henan.